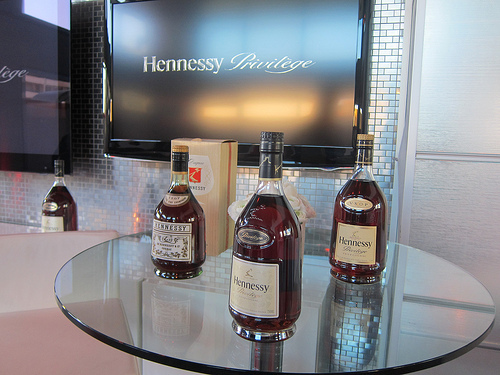 Before I headed off to New York for Manhattan Cocktail Classic, I had the chance to view Hennessy Privilege‘s new bottle design at the Watermarke Tower in Downtown Los Angeles. It was really cool to see the bottle from the 1950s and the one we’re more familiar with designed in the 1990s. The spokesperon for Hennessy Privilege, actor Laz Alonzo, was on hand to moderate the discussion with designer Chris Bangle and Olivier Pautes from House of Hennessy. Chris Bangle had never designed a liquor bottle before. He is best known for his car designs, particularly for BMW. The iconic bottle had subtle modifications. It’s a bit taller but you don’t want it to look like there’s less in the bottle so he dimpled the bottom upwards much like a champagne bottle. 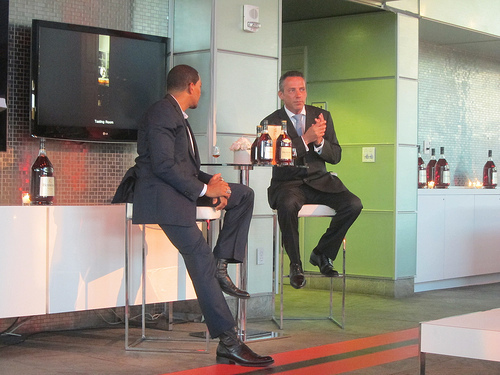 Next Laz invited Olivier Pautes from the Hennessy to join him. Monsiur Pautes described the rigorous tastings they did daily to ensure the quality of the product. We started tasting at this point. 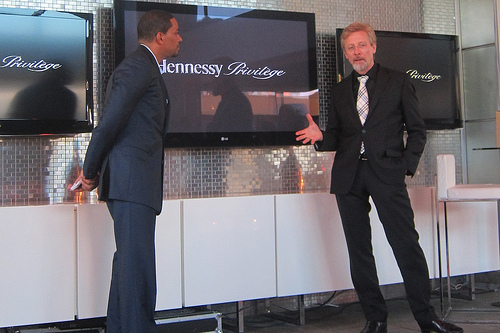 Hennessy Privilege is smooth with vanilla notes. Interesting enough, the cognac was paired with first scallops then beef then chicken. I liked the scallops best with the Hennessy Privilege. It was a bit of a surprised to me as I didn’t particularly think of Hennessy Privilege as something to sip on during dinner. Yet as Monsiur Pautes mentioned, there’s something quite gratifying about drinking Hennessy Privilege daily versus saving the bottle for a special occasion. 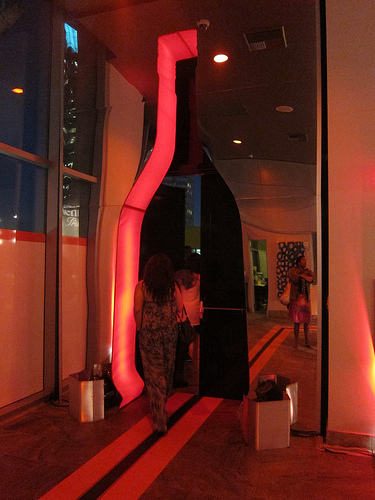 After dinner, we crossed the Hennessy Privilege bottle shaped doorway to the party outside. 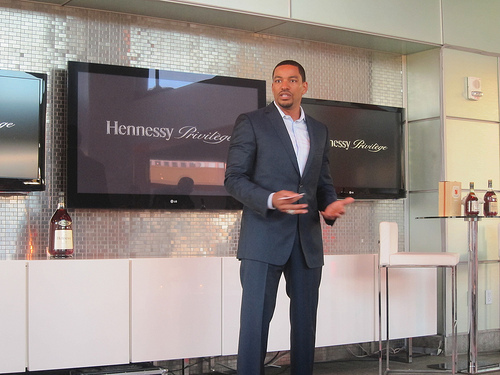 We met Jordan Bushell, the mixologist for Hennessy Privilege. 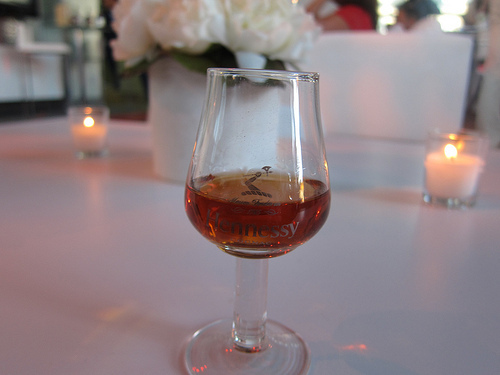 We had sampled the cognac straight without ice and now it was time to try it in a few cocktails. Jordan is a master mixologist based in Toronto. First I tried the Hennessy Privilege Smash (Hennessy Privilege, lemon, mint, simple syrup, soda) which was very refreshing. I also had a taste of the Hennessy Privilege Sazarac (Hennessy Privilege, absinthe rinse, Peychaud’s bitters, simple syrup, lemon twist)- not shown. As expected, it was good. The popular cocktail of the evening was the Privileged Bramble (Hennessy VSOP, cassis, lemon, blackberries, lemon twist). I’m not sure how this was the bramble as it wasn’t over crushed ice but it worked well enough. 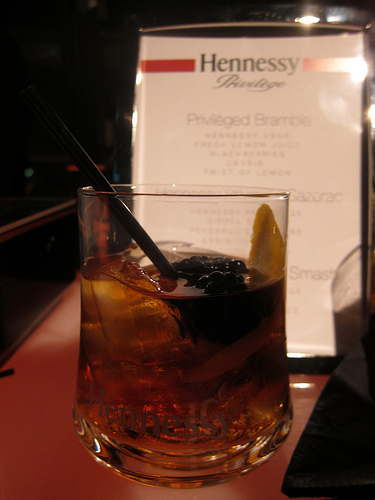 I appreciated being able to taste Hennessy Privilege neat versus in a cocktail. 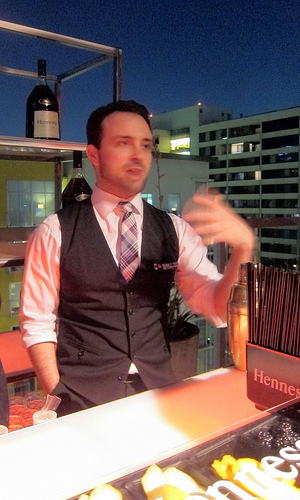 While I enjoyed it both ways, there’s nothing like a snifter of cognac and strolling around the rooftop party. Like its new bottle design, it’s an instant timeless classic. 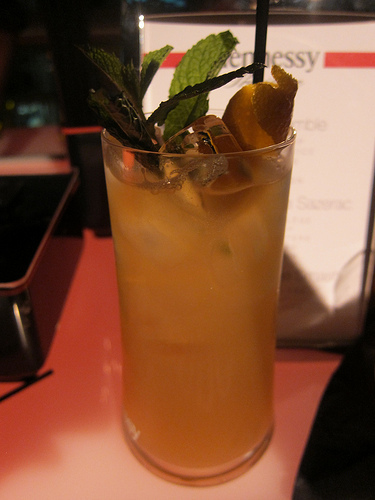 This entry was posted in alcohol education, alcohol tasting, bartenders, cocktails, events, history, hot bartenders, spirits, the minty and tagged bramble, chris bangle, cognac, french, hennessy, hennessy privilege, jordan bushell, laz alonso, olivier pautes, sazarac, smash, tasting. Bookmark the permalink.